In 2017, Romania initiated a visionary defence procurement program that will reinforce NATO’s Eastern flank and make the Romanian military a leading force in the Black Sea by the early 2020s…. In 2017, Romania initiated a visionary defence procurement program that will reinforce NATO’s Eastern flank and make the Romanian military a leading force in the Black Sea by the early 2020s. The $11.6 billion shopping list includes top-of-the-line products such as Raytheon’s latest Patriot air defense system. The assets are specifically tailored to counter the Russian threat in the Black Sea – namely Russia’s naval supremacy, anti-access area denial (A2/AD) capabilities and theater ballistic missiles (TBM) deployed in Crimea. While ambitious in nature, Romania’s procurement program is continuously disrupted by governmental corruption and mismanagement resulting in indefinite delays for strategic air-naval programs. 1. Russia’s annexation of Crimea in 2014 has shaken the Black Sea region from its century-long geopolitical slumber. Moscow’s military build-up in Crimea – only 400 km from the Romanian coast – has transformed the Black Sea into a substantial missile engagement and interdiction zone, placing the region at the very top of NATO’s agenda. 2. The Russian Aerospace Forces (RuAF) and Russian Navy (RuN) currently operate more than 15 naval and air bases in Crimea. The port of Sevastopol hosts the RuN’s 30,000 men strong Black Sea Fleet (BSF), which is responsible for operations in the Black Sea, Azov Sea and the Mediterranean. 3. Concerned about the mounting Russian presence at its doorstep, Romania has welcomed a number of strategic U.S. and NATO military installations on its soil. Over the past years, Bucharest has promised to allocate 2% of its GDP to defense in order to boost its naval warfare, missile strike and air defense capabilities. While the Romanian Ministry of National Defense (MoND) has made progress in all fields, systemic corruption and administrative inability continue to obstruct the procurement program. The naval branch remains notably exposed. 4. Russia strives to establish naval supremacy in the Black Sea. The BSF currently consists of 47 warships and seven submarines, most of which are stationed in the strategic city-port of Sevastopol and the Novorossiysk auxiliary naval air base. While the fleet is largely outdated, around 18 new or modernized warships are expected to join the BSF by 2020. 5. Even in its current state, the Russian BSF holds strike superiority in both surface and subsurface naval warfare. All major vessels stationed in Crimea are equipped with standoff range anti-ship missiles (ASM) and anti-submarine weapons (ASW). The naval assets are supported by land-based (road-mobile, naval infantry and coastal batteries) and airborne (mostly Mi-14, Mi-24 and Su-30) ASM/ASW units. The large number and variety of surface and subsurface missiles pose an acute threat to NATO and the neighboring countries. 6. Consequently, Romania promised to prioritize naval defence procurement. The Romanian Navy’s (RoN) surface warfare capabilities will be enhanced by the acquisition of four multi-purpose corvettes, worth $2 billion, and an unspecified number of naval strike missile (NSM) coastal defense batteries. Two existing Type-22 corvettes, the Regele Ferdinand and Regina Maria, will be modernized in the course of the same program. The corvettes are scheduled for commission between 2021 and 2023. 7. The missile type deployed on the new assets will be a decisive factor for the success of the surface warfare program. 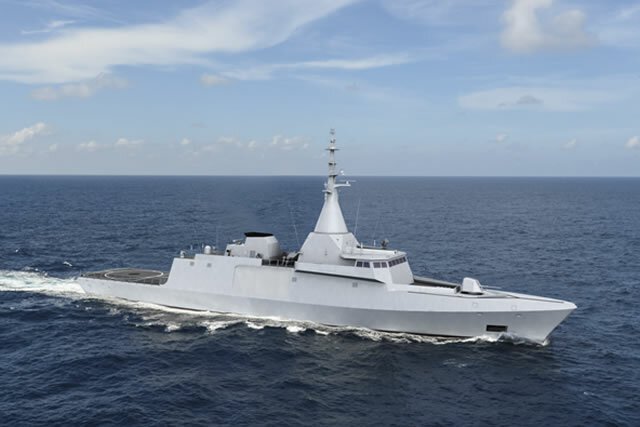 Given the BSF’s mass proliferation of supersonic anti-ship and land-attack cruise missiles (such as the 3M-14 Kalibr/ NATO reporting name: SS-N-30), the RoN’s corvettes require adequate shipborne interceptors, high-frequency surface wave radars and a potent striking capability. The tumultuous competition was won by Naval Group’s Gowind 2500-class multimission corvettes. Armed with MDA MM40 Exocet anti-ship missiles, VL Mica ship-based SAMs, torpedos and two cannon systems, the Gowind promises a low-observability system integration. The Egyptian Navy is the only other Gowind-operator. 8. While the corvettes will be an important addition on the surface, the RoN remains critically under-equipped for subsurface warfare in the short to medium term. The MoND’s ambitious submarine program aims to build three submarines and modernize the only existing one, the Kilo-class Delfinul, which is currently used for training. However, the lack of financial resources and technological know-how render it highly unlikely that Romania will commence with the submarine program before 2026. 9. The RoN’s seaborne (surface and subsurface) capabilities will be augmented by the Romanian Air Force (RoAF), which is responsible for policing the maritime airspace. In the past years, the Romanian maritime airspace has been repeatedly violated by the Russian Aerospace Force (RuAF) - especially when the U.S. Navy’s Sixth Fleet and NATO’s Maritime Standing Group 1 and 2 conduct semi-permanent sea patrols in the region and dock in Romanian ports. 10. As part of its multirole fighter program aimed at increasing its maritime security and air defense capabilities, Romania purchased twelve F-16 A/B Block 15 Mid Life Upgrade (MLU) Fighting Falcons from the Portuguese Air Force. The combat weapons system acquired by the MoND for the Fighting Falcons consist of 30 AIM-120 AMRAAM and 60 AIM-9M Sidewinder air to air missiles and 10 GBU-12 and 18 AGM-65H/KB Maverick ground attack ordnance. The F-16s, assigned to the 53rd Warhawks Fighter Squadron have achieved operational capability in 2018 and later assumed air policing duties over Romanian airspace in mid-March 2019. The MoND plans to increase the RoAF’s F-16 inventory with 36 newly-built airframes needed to replace its obsolete MiG-21 Lancer C (NATO reporting name: Fishbed). 11. While the F-16 AM/MB is a suitable for boosting inter-operability and for basic mission profiles such as air policing, close air support and ground attack, it does not sufficiently threaten Russia’s Anti-Access/ Area Denial (A2AD) zone in Crimea. The RoAF would have required fifth or fourth generation “plus” fighter jets or the latest block versions of the Fighting Falcon, capable of carrying anti-radiation missiles (ARM), ASM and standoff air-launched cruise missiles, in order to credibly challenge the BSF and SAM fortifications in Crimea. 12. The Russian forces in Crimea are safeguarded by a robust, multi-layered and augmented network of integrated area and point air defenses. Three Russian forces in Crimea are primarily defended by the S-400 Triumf (SA-21 Growler) the Kremlin’s latest SAM technology. The S-400 Triumf creates an impenetrable area air defense (AAD) cover, capable of parrying multiple airborne assets, ballistic missiles and cruise missiles in a 400 km radius. Furthermore, numerous S-300 (SA-20) SAM systems are scattered throughout the region, providing an additional AAD layer. A very high, but unknown number of Pantsir S-1s (SA-22), BUKs (SA-11), 9k33 Osa (SA-8 Gecko) and anti aircraft artillery (AAA) provide point air defense (PAD) for military installations, artillery batteries and SAM sites. 13. The ground-based air defenses in Crimea are supported by a layer of electronic warfare (EW) and EW-countermeasure (EWCM) systems. The Russian tip-of-the-spear EW capability is the Krasukha 2/4, which is able to jam communications, low earth orbit spy satellites, missiles, and unmanned aerial vehicles (UAV). As EWCM, the Russians have installed radars that provide frequency diversity across the Crimean peninsula and interlink with the AAD and PAD layers. 14. A Podsolnukh over-the-horizon radar stationed on Crimea’s Southwestern coast furthermore provides early warning data, reaching as far as the Bosphorus. Supported by airborne and seaborne radars, the BSF can thus detect and - in case of war - rapidly engage adversaries entering the Black Sea. 15. In response to Russia’s A2/AD zone, Romania saw it necessary to acquire a long-range rocket artillery system capable of contesting Russian air defenses in Crimea. In order to pose a credible threat, the artillery system has to be battle-proven, technologically superior to its competitors and able to fire smart and cluster munition with a range of 400 km. As the U.S. High-Mobility Artillery Rocket Systems (HIMARS) ticks all these boxes, Romania has placed a $1.5 billion order for 54 HIMARS and ammunition. 16. The HIMARS is the Pentagon’s long-range artillery of choice in the hottest conflicts. The system is currently stationed near the 38th parallel (South Korea) and the al-Tanf garrison (Syria) and is used to engage ISIS and Taliban targets in Syria and Afghanistan. After receiving its HIMARS batteries in 2019, Romania will be the first European operator of the system. The coast-based Romanian Marines Regiment will likely receive most of the HIMARS batteries, bringing the Western coast of Crimea within range. 17. According to NATO, Russia has moved the Iskander-M (SS-26 Stone) nuclear-capable mobile ballistic missile system to Crimea. Two videos, which surfaced on social media in 2016, show that at least five MZKT-79306 Iskander launcher trucks and support vehicles are present in Crimea. The domestic version of the Iskander-M has a maximum range of 450 km. The system is able to bypass enemy air defense systems by releasing decoy clusters at 30G speed in the terminal phase. The agile and evasive artillery system is considered to be the most dangerous theater ballistic missile (TBM) in Russia’s arsenal. The RoN’s command headquarters for river boat patrol (Tulcea, Braila), the corvette squadron (Mangalia) and the frigate flotilla (Constanta). 19. To counter the Russian missile-threat, Romania has ordered seven MIM-104 Patriot 3 (PAC-3) long-range SAM systems manufactured by Raytheon. The PAC-3 is the latest configuration of the Patriot system. The PAC-3 updates are based on more than 20 years of U.S. battlefield experience and feedback from 13 foreign customers. The $3.9 billion order will be delivered to the Romanian Land Forces and the RoN in 2019. 20. The PAC-3 is highly efficient against evasive and fast-moving TBMs such as the Iskander-M and the Kalibr (in all versions). The PAC-3 batteries fire rockets equipped with Missile Segment Enhancements (MSE) to intercept and destroy enemy TBMs in their terminal phase. The MSE increases velocity, extends the flight range by 50% and has a lethality enhancer warhead to guarantee hit-to-kill performance. For now, Romania has ordered 165 MSEs for the newly acquired PAC-3 batteries. 21. The PAC-3 uses the C-band passive electronically scanned phased array AN/MPQ-65 radar, which is difficult to target for enemy anti-radiation missiles (ARM). The AN/MPQ-65 radar can track over 100 targets at high-altitude, without emitting signals that radar-homing missiles can lock on. This capability potentially discourages adversarial Suppression/ Destruction of Enemy Air Defenses (S/DEAD) sorties. 22. The PAC-3 batteries will form an area air defense (AAD) barrier over Southeastern Romania, which will cover the highly populated and strategically important region. The PAC-3 AADs will receive short and medium-range point-area defense (PAD) from Romania’s existing SAMs and anti-aircraft artillery such as the MIM-23 Hawk and Soviet-made assets. Ultimately, the Romanian AAD- PAD bubbles will work interlinked with the U.S-operated Naval Support Facility in Deveselu (Romania) and the guided missile destroyers based in Rota (Spain) as part of the Aegis Ballistic Missile Defense System. Together, the PAC-3-Aegis duo will provide a reliable, multi-layered, and integrated air defense network for NATO’s Eastern flank. This assessment has been updated. This assessment does not include the products ordered by the Romanian Land Forces (RLF). The RLF is currently operationalizing the first 12 of the total 227 8x8 Piranha V infantry fighting vehicles (IFV) purchased from General Dynamics. Starting in 2020, the land forces will also receive 347 8x8 Agilis vehicles (armored transporter, amphibious and IFV variants) jointly produced by the Romanian Military Vehicle Systems and Rheinmetall Defense.